Marshawn Lynch of the Seahawks just likes to play football, and he isn’t as interested in talking to the media. Marshawn Lynch’s reluctance to talk to the media — actually, it’s more often a flat refusal — has had one chief consequence: It has led to his money and his wallet going their separate ways. Lynch, the Seahawks’ relentless running back, has proven just as elusive off the field in fulfilling his requisite media obligations. That led to a $100,000 fine in late November — $50,000 for leaving the locker room before reporters arrived after a 24-20 loss to Kansas City, and another $50,000 for a past transgression from Super Bowl XLVIII in which the fine was suspended with the caveat that he’d have to pay it if he failed to cooperate in the future. That’s a steep price to pay to maintain silence, and one suspects Lynch’s six-figure fine brought him a consensus of sympathy. The general public seems to care less and less about an athlete’s media obligations with each passing Sunday. That’s understandable to some degree. In an era in which it’s easier for players and their publicists to control the message via social media — not to mention an era in which the Stephen A. Smiths of the world find that scrubbing the line between reporter and so-called entertainer can be quite lucrative — the notion that media’s primary quest and obligation is to sift for the truth tends to be greeted cynically. There’s no doubt that the media, with certain compromises, self-inflicted shots to credibility, and failures to adjust to the times, has contributed to that attitude. But the wholesale skepticism of the media’s role and place of importance, even in sports, is short-sighted and hazardous. As Derek Jeter’s self-serious The Players Tribune, which launched with a piece by Lynch’s teammate, QB/senior editor Russell Wilson, proved, athletes rarely ask the right questions of themselves or, worse, do not want the right questions asked. The axiom that the media is the middleman between the athletes and the fans remains accurate — and a reminder of the necessity of that role arrived with an NFL Network interview Sunday with, of all people, Lynch. The interview was conducted by NFL Network analyst Michael Robinson, who just happened to be Lynch’s teammate and fellow running back on the Seahawks last season. Sure, the kinship got the interview. But Robinson was poised and prepared. And because Lynch, nicknamed Beast Mode for his ferocious running style, is a quirky and somewhat mysterious character who is rarely in shoot-the-breeze mode, the conversation was assured of generating a headline or two no matter whether he actually said anything of substance. He certainly has been that. Lynch has made four Pro Bowls and is a favorite to make a fifth this season. 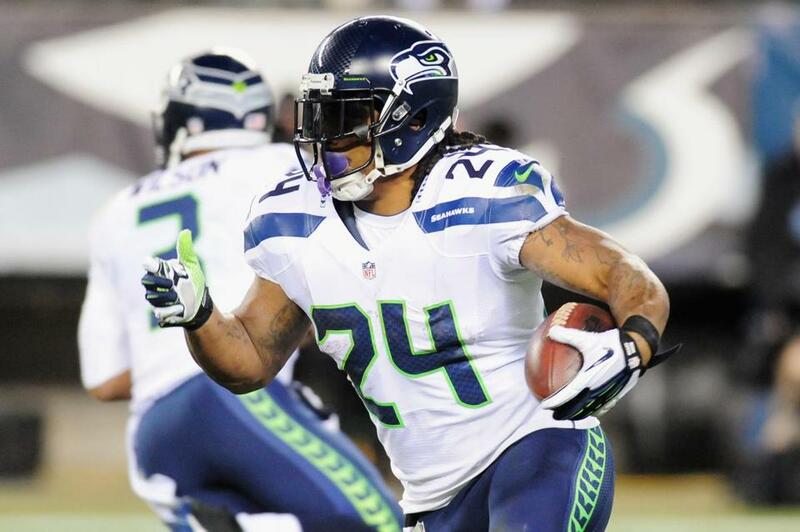 During the Seahawks’ 24-14 win over the Eagles Sunday night, Lynch surpassed 1,000 yards for the season. It’s the sixth time he’s eclipsed that plateau. But one of the revelations from the interview is that he believes his figurative stiff-arming of the media will keep him from the ultimate individual achievement: election to the Pro Football Hall of Fame. At the moment, Lynch looks like a player who will be worthy of more consideration than one might initially think. Pro-football-reference.com features a metric that allows for players of different eras to be compared by the length, shape, and quality of their careers. Though seven full seasons, Lynch’s top comp is John Riggins, who was fitted in Canton for a mustard-colored jacket in 1992. The next few seasons will clarify the 28-year-old Lynch’s case. For now, we can say this: There’s a better chance Lynch ends up in Canton than as an analyst on one network or another. But the idea, as far-fetched as it seems now, shouldn’t be completely dismissed. After all, no one figured Randy Moss, recalcitrant with the press in his day, would end up on TV. And a post-career gig as a talking head would be an ironic way for Lynch to make back that money paid to maintain his own silence. Chad Finn can be reached at finn@globe.com.